ICA69 (islet cell Ag 69 kDa) is a diabetes-associated autoantigen with high expression levels in β cells and brain. Its function is unknown, but knockout of its Caenorhabditis elegans homologue, ric-19, compromised neurotransmission. We disrupted the murine gene, ica-1, in 129-strain mice. These animals aged normally, but speed-congenic ICA69null nonobese diabetic (NOD) mice developed mid-life lethality, reminiscent of NOD-specific, late lethal seizures in glutamic acid decarboxylase 65-deficient mice. In contrast to wild-type and heterozygous animals, ICA69null NOD congenics fail to generate, even after immunization, cross-reactive T cells that recognize the dominant Tep69 epitope in ICA69, and its environmental mimicry Ag, the ABBOS epitope in BSA. This antigenic mimicry is thus driven by the endogenous self Ag, and not initiated by the environmental mimic. Insulitis, spontaneous, and adoptively transferred diabetes develop normally in ICA69null NOD congenics. Like glutamic acid decarboxylase 65, ICA69 is not an obligate autoantigen in diabetes. Unexpectedly, ICA69null NOD mice were resistant to cyclophosphamide (CY)-accelerated diabetes. Transplantation experiments with hemopoietic and islet tissue linked CY resistance to ICA69 deficiency in islets. CY-accelerated diabetes involves not only ablation of lymphoid cells, but ICA69-dependent drug toxicity in β cells that boosts autoreactivity in the regenerating lymphoid system. Type I diabetes (T1D)4 is the consequence of chronic progressive autoimmunity that targets pancreatic islets of Langerhans, selectively eliminating insulin-producing β cells. Causes that underlie the development of diabetic autoimmunity remain obscure. Products of some 20+ predisposing genes interact with critical environmental accelerators and decelerators to generate the autoimmune phenotype (1). Clinical insulin deficiency and its attendant metabolic abnormalities are the end result of a drawn-out prediabetes phase, in which autoreactive T cell pools accumulate in the islet. Prediabetes proceeds in a stepwise fashion (2, 3), from benign periinsulitis to islet invasion and progressively rising rates of β cell death, as signaled by the generation of autoantibodies (4, 5). Because of the difficulty of tissue access in humans, much of the current view of autoimmune diabetes derives from the excellent rodent models for the disease, BB rats and nonobese diabetic (NOD) mice (6, 7). However, many years of prediabetes are a reality of the human disease, in which B and T cell autoimmunity arise many years before and can persist for decades after onset of overt disease (see Refs. 8, 9, 10). A similar set of autoantigens is targeted by self-reactive T cells in human and murine diabetes, including insulin/proinsulin, glutamic acid decarboxylase 65 (GAD65), GAD67, ICA69 (islet cell Ag 69 kDa), and IA-2/phogrin (1, 7). Of these, only insulin is (nearly) β cell specific, while others follow generally neuroendocrine gene expression profiles. In NOD mice, immunotherapies with any one of these autoantigens can halt, and in some circumstances accelerate development of overt diabetes, depending on the choice of epitopes and the timing of interventions early or later in prediabetes (11, 12, 13, 14, 15, 16, 17). While there may be a hierarchy among autoimmune targets, in particular early on (18), established prediabetes involves multiple T cell pools that home to the islet, targeting more self epitopes with increasing effectiveness (19, 20, 21). The progression of prediabetes is complex and passes through checkpoints that halt progression for some periods of time (2). A single dose of cyclophosphamide (CY), an alkylating cancer pro-drug (22), overcomes these checkpoints and allows rapid diabetes development in a process that is dominated by the local activation of myeloid APCs and their cytokine products (3). In this commonly used diabetes model, CY was suggested to remove regulatory hemopoietic cells (23, 24), in a host whose lymphoid cell lineages are relatively resistant to the drug and able to mount a dramatic recovery of lymphoid mass quickly after drug exposure (25). Data presented in this work suggest that the drug’s role in diabetes development is more complex and critically depends on direct islet cell toxicity in a process that appears to require the function of ICA69. To explore the role of self Ag in prediabetes and its progression to overt disease, we disrupted the genomic locus of the autoantigen, ICA69 (14, 26, 27), and backcrossed the defect onto NOD, using a speed-congenic strategy (28). The conserved ICA69 gene, ica-1, maps to human chromosome 7p22 and a synthenic location on mouse chromosome 6A1, 2, neither location mapping near known diabetes risk loci (27, 29). The molecule has a neuroendocrine expression pattern with peak levels in brain and β cell lines (30). Its function is unknown, but we found that Caenorhabditis elegans deficient for the well-conserved ICA69 homologue, ric-19, develops a neurotransmission defect (31). The protein includes a single, dominant T cell epitope, Tep69 (major T cell epitope in ICA69), targeted by autoreactive T cells in both human and NOD mouse T1D (26). There is well-established antigenic mimicry between this epitope and the ABBOS epitope in the commonly encountered, dietary Ag, BSA (14). BecauseABBOS is a highly dominant BSA epitope in NOD mice, it appeared possible that ICA69 autoimmunity might be triggered through mimicry with BSA/ABBOS (10, 14, 32), encountered through exposure to dietary cow milk protein, a risk factor for diabetes development (33, 34, 35, 36). Observations in ICA69null NOD congenics now indicate that the routinely generated Tep69/ABBOS mimicry T cell pools require and are driven by the endogenous self Ag, which also dictates the apparent dominance for ABBOS in BSA immune responses of wild-type NOD mice. The 129SvJ mice with ICA69 deficiency had no obvious phenotype and aged normally. However, speed-congenic ICA69null NOD mice develop sudden lethality beginning in early middle age, reminiscent of GAD65 deficiency that produces mid-life lethal seizures only on the NOD background (37). ICA69null NOD female congenics develop diabetes at essentially wild-type NOD incidence. Like GAD65 (38), ICA69 emerges as a facultative, but not obligate element in diabetes progression. Surprisingly, and challenging current views, ICA69null mice were highly resistant to CY-accelerated diabetes due to a previously unrecognized drug effect on islets, which appears to require the function of ICA69. NOD/Lt (H-2g7) mice were bred in our rodent facility according to approved facility guidelines and protocols. Experiments were performed in our conventional unit, which presently has an 83–86% diabetes incidence in 36-wk-old female mice. Spleen cells from three to five recently diabetic NOD females were pooled, and 107 cells were transferred i.v. to 6- to 8-wk-old, irradiated NOD male (650 rad) or NOD.scid (200 rad) recipients. In all experiments, glucosuria (TesTape, Lilly, Toronto) was used for daily diabetes screens. Diabetes was confirmed through blood glucose measurements on 2 consecutive days (13.8 mM/L, SureStep; Life Technologies, Burnaby, British Columbia, Canada). To induce accelerated diabetes development, 8- to 10-wk-old wild-type, heterozygous or homozygous ICA69 knockout females received one i.p. injection of 250 mg/kg CY (Sigma, St. Louis, MO). In some experiments, 14-wk-old animals were used, or a second injection was given 3 wk later. Islets were isolated from pancreata of 4- to 5-wk-old wild-type NODs by standard digestion and manual picking procedures (39). The grafts were placed under the kidney capsule of anesthetized, 8-wk-old ICA69null NOD females. Sixteen days later, the recipients were treated with 250 mg/kg CY, and diabetes development was monitored for at least 4 wk. Sham-operated and nontransplanted wild-type NOD and ICA69null mice provided controls. The ICA69 locus occupies approximately 100 kb on mouse chromosome 6 (27, 29). A murine 129SvJ genomic library (gift of T. Mak, Toronto, Canada) was screened with a full-length ICA69-α cDNA probe (26). A 2.7-kb clone containing exon 2 was excised with BglII and subcloned into pBluescript II-SK upstream of a herpes simplex thymidine kinase expression cassette. The aminoglycoside phosphotransferase (neo) gene was excised from the pPNT vector and ligated into a StuI site at position 107 of exon 2, thus disrupting the coding region of the Tep69 epitope in ICA69 (27). 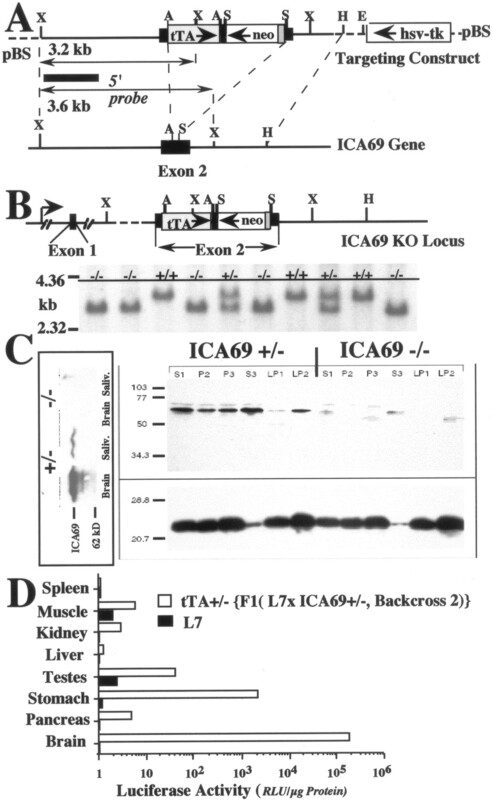 The tetracycline transactivator (tTA) coding region (40, 41) (gift of H. Bujard, Heidelberg, Germany) was moved in-frame into an AgeI restriction site at position 38 of exon 2 in ICA69 (see below, Fig. 1⇓). This was thought to allow future experiments, such as possible rescue of knockout phenotypes through doxycycline-regulatable expression of a tet07-ICA69 transgene (42). The function of the targeting vector, including the tTA knock-in, was confirmed in NIT-1 β cells (43) with one allele replaced by the vector. Transient transfection of these cells with low copy numbers of a tet07-luciferase expression plasmid (40) (gift of H. Bujard) resulted in excellent luciferase expression that was over 98% suppressed in the presence of 1 μM doxycycline (Hammond-McKibben et al., manuscript in preparation). Development of ICA69null mice. A, The ICA69 locus was genetically disrupted by insertion of tTA and neo genes into exon 2 of the ICA69 gene. The top diagram shows the targeting construct that targeted the ICA69 gene (bottom) and generated the knockout allele shown at the top of B. B, Southern blot of XbaI-restricted genomic DNA from 129vJ x NOD mice backcross 2. The knockout allele generates a shortened 3.2-kb exon 2 fragment. C, Western blots of brain and salivary gland tissue extracts (backcross 11 mice, left panel) and fractionated brain protein from wild- type and homozygous ICA69 knockout mice (backcross 7) were probed with anti-ICA69 polyclonal Ab. A 23-kDa synaptic vesicle marker, VAMP2, is shown below. S1, postnuclear supernatant; P2, synaptosomes; S3, cytosol; P3, microsomes; LP1, plasma membrane; LP2, synaptic vesicles. D, Luciferase activity (relative light units/μg protein) in different tissues from L7 (tet07-luciferase transgenic) mice carrying a single ICA69 knockout/tTA-knock-in allele from backcross 2 mice (open bars). Expression patterns follow the tissue expression of ICA69. L7 mice without the tTA transgene express only background activities (filled bars, note the logarithmic scale). Targeting vector DNA was linearized with NotI and transfected into the R1 ES cell line, and multiple clones were selected in the presence of G418 and gancyclovir (44). Double-resistant embryonic stem cell clones (19 of 482 screened) were expanded for use in morula aggregations with fertilized NOD eggs (44), and chimeric male offspring were bred with NOD females. Transmission was analyzed by standard Southern blots (27). Offspring with germline transmission of the ICA69null allele were backcrossed to NOD in a speed-congenic strategy (28). One founder repeatedly generated offspring with germline transmission of the null allele, and one of these ICA69+/− heterozygous offspring was homozygous for NOD variants of D6 Mit52 and D6 Mit339 on chromosome 6, suggesting a crossover event that replaced a considerable stretch of 129SvJ strain chromosome 6 with NOD genomic DNA. This male was mated to wild-type NOD females (backcross generation 2). Several offspring from backcross 5 were homozygous NOD for all 17 Idd loci, according to microsatellite markers (28). The ICA69-deficient mice analyzed in the present study were derived from backcross 7. Mouse brain tissue was fractionated as described (31). Briefly, brains were homogenized in ice-cold, supplemented HBSS buffer. Nuclei and cell debris were removed, and supernatant (S1) was centrifuged at 13,000 × g for 13 min. Supernatant was collected and spun at 100,000 × g for 30 min to yield S3 (the cytosol) and P3 (the microsomal pellet). The synaptosome fraction was washed with HBSS buffer and centrifuged at 13,000 × g for 13 min. The pellet was lysed, buffered (10 mM HBSS, pH 7.4), and centrifuged at 45,000 × g for 20 min. The pellet (LP1) was resuspended in HKA buffer (10 mM HEPES-KOH, pH 7.4, 140 mM KoAC, 1 mM MgCl2, 0.1 mM EGTA, 0.3 mM PMSF), while the crude synaptic vesicles were pelleted by further centrifugation of the supernatant at 150,000 × g for 1 h, then resuspended in HKA buffer. All procedures were performed on ice. Rabbit anti-ICA69 (gift from M. Pietropaolo, Pittsburgh, PA) was used at a final dilution of 1/7500 (30). Each subcellular fraction (40 μg) was separated on SDS polyacrylamide gels and transferred to nitrocellulose. Peroxidase-conjugated goat anti-rabbit Ab (The Jackson Laboratory, Bangor, ME; 1/15,000) was used to detect bound primary Ab. Rabbit anti-VAMP-2 provided a marker of synaptic vesicles (gift from W. Trimble, The Hospital For Sick Children). Tissues for histological sections were fixed in 10% neutral buffered Formalin and stained with H&E. The degree of insulitis was scored blindly by two observers, using the following scale: 0, normal islet; 1, periinsulitis; 2, invasive infiltration of 25%–50% of islet surface area; 3, invasive infiltration of greater than 50% of islet surface area or a small retracted islet. Immunohistochemistry for insulin was performed on Formalin-fixed, paraffin-embedded tissue sections using guinea pig anti-insulin Ab and rabbit HRP-conjugated secondary Ab (Dako Diagnostics, Mississauga, Ontario, Canada). Reactions were visualized using diaminobenzidine peroxidase substrate, and sections were counterstained with hematoxylin. In vitro T cell proliferation was measured as described recently for immunized and nonimmunized NOD mice (16). Immunizations employed s.c. injection of a given Ag, 100 μg emulsified in CFA. Regional lymph nodes were removed 9–10 days after immunization, and 4 × 105 cells/well were cultured in serum-free AIM V medium (Life Technologies) to measure recall responses to 0.01–100 μM Ag. After 60 h, cultures were pulsed overnight with 1 μCi [3H]thymidine and subjected to scintillation counting. Spontaneous T cell proliferation in spleen cells from unimmunized naive or adoptively transferred mice was similarly measured, except for the addition of 10 U human rIL-2 (45). Synthetic peptides were highly purified and confirmed by mass spectroscopy: Tep69, AFIKATGKKEDE, ABBOS, FKADEKKFWGKYLYE. Grade V BSA and OVA were purchased from Sigma. Purified, mouse rICA69-β was prepared as described (26); rGAD65 was purchased (Diamyd Diagnostics, Stockholm, Sweden). Numeric values were compared by Mann-Whitney or Welsh tests; significance was set at 5%; and all tests were two tailed. Tables were used to compare diabetes incidence in different groups of animals (Fisher’s exact test); odds ratios were calculated with Woolf’s approximation. The targeting construct (Fig. 1⇑A) introduces a neomycin resistance cassette to disrupt the Tep69 epitope in exon 2 of ICA69, and inserts the tTA coding region in-frame after the leading 9 ICA69 aa residues, followed by poly(A) and stop sites. Homologous recombination of this vector in its genomic target locale introduces an additional XbaI site that produces a 3.2-kb XbaI restriction fragment, while the corresponding wild-type fragment is 3.6 kb in length (Fig. 1⇑A). Homologous recombination of the targeting construct was confirmed in genomic DNA of progeny from several chimeric founders, using a 5′-end probe and XbaI restriction (Fig. 1⇑B) and a neo probe and HindIII restriction (not shown). Several litters of this generation of 129SvJ x NOD offspring were monitored for up to 26 mo, including 17 ICA69null animals derived from brother-sister matings. No spontaneous deaths or obvious abnormalities were observed. ICA69 is expressed at low to very low levels in a variety of tissues, with its major expression locale in the brain, and highest levels found in β cell lines (30). Almost certainly reflecting posttranslational modifications, Western blots resolve ICA69 as a doublet band of approximately 69 kDa, despite its calculated mass of 55 kDa (30, 46). There was no detectable ICA69 in Western blots of brain and salivary gland extracts from backcross 7 (not shown) or backcross 11 mice (Fig. 1⇑C, left panel), but there were occasional ghost bands in brain subcellular fractions (right panel). These bands were not consistent, and could be detected only with one rabbit Ab raised against a C-terminal peptide (46) (Fig. 1⇑C), but not with another rabbit Ab raised against a large, truncated ICA69 fragment (not shown). We were unable to obtain sufficient material for mass spectrography and sequencing studies of these ghost bands. As described below, the distinct phenotypes of these mice, results of extensive RT-PCR, Southern blot, and genomic PCR studies of the disrupted gene locus, and in particular the silencing of the natural ICA69 promoter (see below) make a hypomorphic phenotype with remnant gene expression of gene fragments from this locus unlikely. Heterozygous (ICA69+/−) progeny from backcross 2 were mated with the L7 transgenic mouse that carries a tet07-luciferase transgene (40). Offspring carrying the L7 transgene as well as one ICA69null/tTA+ allele demonstrated high luciferase activity in brain (note the logarithmic scale), low levels in stomach and testes, and borderline levels in pancreas, in which β cells contribute 0.1% of total pancreas tissue (Fig. 1⇑D). The latter observation is consistent with the fact that ICA69 expression in exocrine pancreas is at best minuscule (47). In mice receiving doxycycline ad libitum in drinking water (0.1 mg/ml), luciferase activity was suppressed to background levels (not shown). These observations provided an excellent readout of ICA69 promoter activity. However, similar experiments with mice from backcross 3 showed a >10-fold reduction in luciferase activity, and no activity at all could be detected in offspring from L7 matings with knockout animals from backcross 5 and 7. While Southern blots and genomic PCR gave expected results, transcripts of tTA could be demonstrated by RT-PCR of brain RNA in backcross 2-derived, but not in animals from these latter experiments, indicating loss of ICA69 promoter activity. Transcriptional silencing is not rare among neuronal genes (48), and has been described for GAD65 (49). Autoreactive T cells in wild-type NOD mice (like patients with T1D) recognize the dominant ICA69 epitope Tep69 (10, 26). These T cells show antigenic mimicry with the ABBOS epitope in BSA, and T cell hybridoma as well as alanine replacement studies indicated that these mimicry T cells represent the bulk of ICA69-specific NOD repertoires (16). ICA69null NOD congenics allowed us to determine the role of endogenous self Ag in the development of these self-reactive T cell pools. Immunization with BSA had divergent consequences in heterozygous and homozygous ICA69 knockout mice (Fig. 2⇓A). Both lines of mice generated good and similar proliferative recall responses after a single BSA immunization in complete adjuvant. However, only heterozygous (+/−) animals generated the coordinate ABBOS and Tep69 mimicry responses typical for wild-type NODs (14, 16). In homozygous ICA69null NOD congenics, ABBOS was no longer a prominent epitope, despite the fact that it binds to NOD I-Ag7 with high affinity (16). Only some low affinity ABBOS responses were observed at a very high peptide dose. No mimicry responses to Tep69 were seen in BSA-immunized ICA69null animals. Thus, the endogenous self Ag is required for the recruitment of precursor T cell pools that recognize both Tep69 and ABBOS, and the presence of these T cell pools is responsible for the strong immunodominance (14) of the ABBOS epitope in BSA. In vitro proliferative recall responses. A, Homo- and heterozygous knockout NOD congenics were immunized s.c. once with BSA emulsified in CFA, and in vitro lymph node responses to BSA, ABBOS, and Tep69 were elicited 10 days later. B, In vitro proliferative response of wild-type, diabetic spleen cells 14 days after transfer to irradiated ICA69−/− (filled columns) or ICA69+/− recipients (open columns). Endogenous self Ag (and not dietary ABBOS) was also critical for the maintenance of these autoreactive mimicry T cell pools. Thus, when knockout mice were adoptively transferred with splenocytes from diabetic wild-type NODs, Tep69/ABBOS-specific T lymphocytes were specifically lost (Fig. 2⇑B, filled bars), while other islet-reactive T cells, such as GAD65-specific pools, were maintained. Consistent with this critical role of the endogenous self Ag, Tep69/ABBOS-specific T cells were maintained in heterozygous ICA69+/− mice adoptively transferred with the same wild-type splenocyte grafts (Fig. 2⇑B, open bars). Autoimmunity to ICA69 is a routine element of prediabetes and of diabetes in wild-type NOD mice and humans (10, 14, 16). Spontaneously diabetic knockout females were observed beginning by wk 20, ∼4 wk later than in wild-type or heterozygous animals (Fig. 3⇓A). This difference was not quite significant (p = 0.058). The consecutive disease development in knockout mice paralleled that in heterozygous and wild-type NOD females (p > 0.3). There was a tendency for slightly less or slower development of invasive insulitis (Fig. 3⇓B), but this again failed to reach significance. Thus, ICA69 appears to be a facultative, but not obligate element in NOD diabetes development. Diabetes development and survival of ICA69null NOD mice. A, Spontaneous diabetes development; ∗, a proportion of ICA69null mice died prematurely (see C) and were removed from the calculation of disease incidence. B, Insulitis in untreated ICA69+/− or ICA69−/− female congenics (seven animals/group) at 10 wk of age. C, Mid-life lethality of ICA69null NOD females without prodromal disease symptoms or diagnostic histopathology. D, Wild-type diabetes development in irradiated ICA69−/−, ICA69+/−, or wild-type NOD mice adoptively transferred with spleen cells from diabetic wild-type donors. This conclusion is somewhat tempered by the unexpected observation of spontaneous lethality in middle-aged NOD female congenics at 4–5 mo of age (Fig. 3⇑C). A subset of these animals died suddenly without prodromal symptoms. These animals had no significant histopathology, except for insulitis commensurate with prediabetes progression and a severed tongue in one animal. This phenotype is reminiscent of GAD65 deficiency, which leads to lethal mid-life seizures on the NOD background (37). Neuropharmacological studies have to date failed to unmask a consistent abnormality in the CNS electrophysiology of ICA69null mice. In our assessment of the spontaneous diabetes incidence in ICA69null mice, we removed the prematurely dead animals from calculation. The implicit assumption that these animals would have developed diabetes at the same rate as survivors is based on the presence of invasive insulitis. Accelerated models of diabetes such as adoptive transfer of diabetic spleen cells circumvent natural checkpoints in prediabetes progression (50). We asked whether the slight delay in spontaneous diabetes development would be amplified or eliminated following adoptive transfer of wild-type diabetic spleen cells into irradiated knockout recipients. The latter was observed: transferred animals developed disease at the same rate and incidence as heterozygous littermates or wild-type controls (Fig. 3⇑D), unhindered by the fact that the knockout mice lost ICA69-specific T cells during disease development (see above, Fig. 2⇑B), and lacked this target autoantigen. 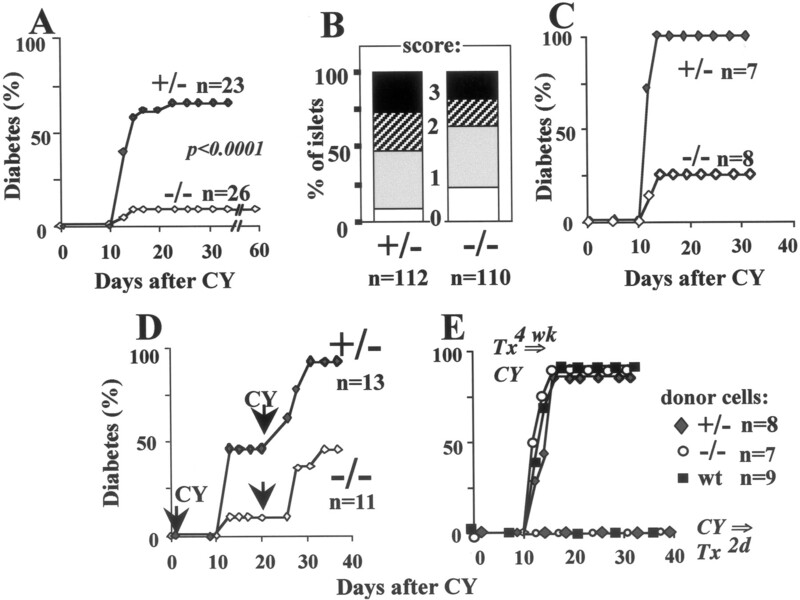 In striking contrast to wild-type and heterozygous animals, injection of CY (250 mg/kg) failed to induce accelerated diabetes in ICA69null mice (Fig. 4⇓). Heterozygous littermates began to develop overt disease by 10–11 days post-CY, reaching a high disease incidence by 3 wk (p < 0.0001, odds ratio 27.4 vs knockout (Fig. 4⇓A), p > 0.3 vs wild-type mice, not shown). ICA69 protein is not expressed in hemopoietic cells (30) (see Fig. 1⇑D for splenocytes). Consistently, there was no detectable effect of ICA69 deficiency in this tissue, with homozygous, heterozygous NOD as well as 129 mice showing the same acute drug-induced fall in spleen weight and cellularity. CY metabolism with generation of, and response to the major toxic intermediates (22) was thus similar in these animals (p > 0.3, data not shown). ICA69−/− NOD mice resist CY-accelerated diabetes. A, Diabetes incidence in CY-treated hetero- and homozygous knockout mice aged 8–10 wk. B, Insulitis score in CY-treated, nondiabetic ICA69+/− (n = 5) and ICA69−/− mice (n = 8) 35 days after drug treatment. The number of nonadjacent islets counted (n) is indicated at the bottom. See Materials and Methods for scoring scale. About one-half of heterozygote islets and only slightly fewer homozygote islets (p = 0.2) had severe, grade 2 and 3 insulitis. C, Diabetes incidence in CY-treated hetero- and homozygous knockout mice aged 14 wk. D, Dual injections of CY on day 0 and 20 in ICA69−/− and ICA69+/− animals. E, Diabetes development in NOD.scid mice reconstituted with 107 ICA69−/−, ICA69+/−, or wild-type spleen cells 1 mo before (Tx→CY) or 2 days after (CY→Tx) CY treatment. Curiously, there was only a slight, nonsignificant difference in insulitis severity of CY-treated homozygous and heterozygous animals (Fig. 4⇑B, p = 0.2), suggesting that effector functions in the islet infiltrate of knockout mice lacked the competence to mediate β cell death. 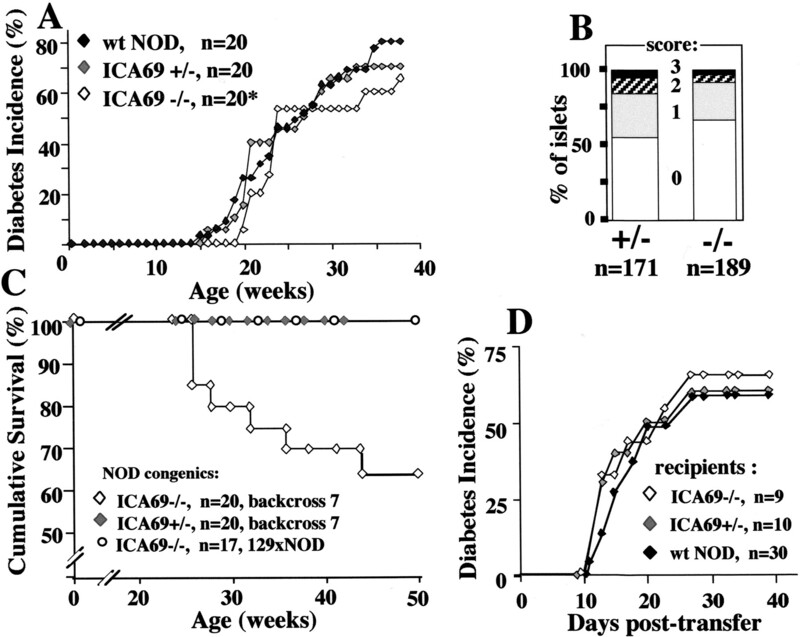 This incompetence was not due to a general delay of prediabetes, since ICA69null NOD mice 14 wk of age, and thus close to the time of overt spontaneous diabetes development, were still protected from CY-induced disease (Fig. 4⇑C). These older animals ultimately did develop diabetes, beginning in wk 20 with the incidence rising at wild-type rates (see Fig. 3⇑A). The resistance to CY-accelerated diabetes in knockout mice was not absolute, since a second CY injection caused diabetes in nearly half of the homozygous mice (5 of 11), compared with 12 of 13 heterozygous animals (Fig. 4⇑D, p = 0.02). CY-accelerated diabetes has been associated with the selective elimination of regulatory T cells and/or with the induction of a massive wave of T cell regeneration that would coexpand diabetogenic pools (23, 24, 51). We more closely examined the CY responses of knockout hemopoietic cells. NOD.scid mice were pretreated with CY 2 days before adoptive transfer of spleen cells from 12-wk-old nondiabetic wild-type mice; diabetes did not develop within the observation period (Fig. 4⇑E, CY→Tx). This confirmed the critical role of acute, drug-induced toxicity in lymphoid cells. However, when NOD.scid mice were reconstituted with 107 spleen cells from 8-wk-old homozygous knockout mice, from heterozygous littermates, or wild-type NOD controls, 1 mo before CY treatment (Fig. 4⇑E, Tx→CY), these transplanted NOD.scid animals developed CY-accelerated diabetes at the same rates and incidence (p > 0.5). This observation demonstrated that hemopoietic cells were not involved in the CY resistance of knockout mice. Collectively, these two observations delineated two drug targets prerequisite for diabetes development, one in hemopoietic and one in nonhemopoietic tissue. Since the islet is one target tissue of CY toxicity (52), we asked whether the nonhemopoietic tissue required for disease acceleration by CY might be the islet itself. We therefore provided ICA69null mice with a source of wild-type islets in small, subrenal islet grafts. Sixteen days later, the engrafted mice were injected with CY as before (Fig. 5⇓A). The presence of wild-type islets reversed the resistance to CY-accelerated diabetes in ICA69null mice, and allowed diabetes development in engrafted knockout animals (p > 0.3, knockout-operated vs sham-operated wild-type NOD; p = 0.016, islet-engrafted vs sham-operated or nontransplanted ICA69null mice). These observations confirm and extend previous, indirect evidence for a duality of CY effects that accelerate diabetes development (53). Transplantation of wild-type islets reverses CY resistance in ICA69null mice. 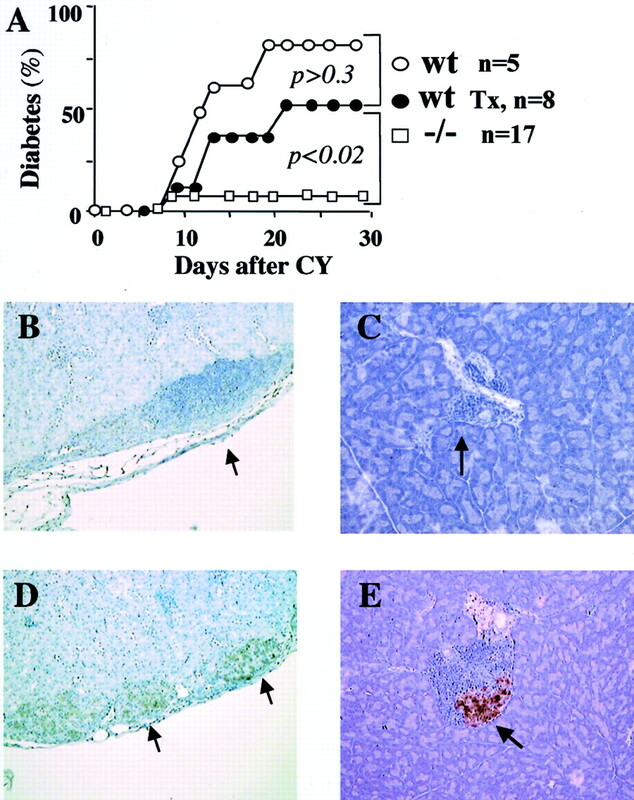 A, Incidence of CY-accelerated diabetes in sham-operated, wild-type mice (O); sham- or nontransplanted ICA69−/− NOD females (□); or ICA69null females with wild-type islet grafts (Tx) under the kidney capsule, transplanted 16 days before CY (•). B–E, Immunohistochemical analysis of transplanted or pancreatic islets (×100, insulin stained in brown, counterstained with hematoxylin). B, Wild-type islet graft under the kidney capsule with massive inflammatory infiltrate (arrow) and absent insulin staining. C, Destroyed pancreatic islet of the same diabetic animal. D, Infiltration, but survival of insulin-producing cells in renal wild-type islet grafts (arrows) from a CY-treated, nondiabetic ICA69null mouse. E, Infiltration, but survival of insulin-producing cells (arrow) in a pancreatic islet from the same animal. Histological examination of transplanted, CY-induced diabetic ICA69null mice showed massive infiltration and complete disappearance of insulin-producing cells in the subrenal, wild-type islet grafts (Fig. 5⇑B). Endogenous (pancreatic) islets in these knockout mice were similarly infiltrated and depleted of insulin-producing β cells (Fig. 5⇑C). Destruction of wild-type islet grafts was a prerequisite for the destruction of endogenous (knockout) islets in the pancreas: those ICA69null mice that escaped CY-accelerated diabetes showed less infiltration and intact insulin-producing cells in the wild-type islet grafts (Fig. 5⇑D). The endogenous islets in these mice were heavily infiltrated, but retained a prominent compartment of insulin-producing β cells (Fig. 5⇑E), suggesting that this infiltrate was incompetent to mediate β cell destruction. These observations suggest that the resistance of ICA69null mice to CY-accelerated diabetes reflects a relative resistance to CY toxicity in β cells, which require ICA69 for an apoptotic drug response (52). Consistently, CY resistance can be bypassed if a source of drug-sensitive islets is present somewhere in the body, suggesting a systemic effect that boosts T cell pools with pathogenic potential during the rapid recovery and expansion of lymphoid cells after CY treatment. Deficiency of ICA69 generated several distinct phenotypes in NOD mice. It answered several core questions about the role of endogenous self Ag in disease-associated antigenic mimicry and the ability of the diabetic autoimmune process to shape disease-relevant T cell pools. The unexpected resistance to CY-accelerated diabetes allowed a reevaluation of its mechanistic basis in vivo. There is previous evidence for acute, CY-mediated islet toxicity that peaks within a day of drug injection and removes a substantial proportion of β cells (52). We have only begun mechanistic studies of how ICA69 might be involved in this process. The function of ICA69 remains unclear. The neurotransmission defect generated by knockout of its neuron-specific C. elegans homologue, ric-19 (31), requires further study, as does the mid-life lethality of ICA69null NOD mice. Current experiments suggest that possible abnormalities in neurotransmission of ICA69null mice will be subtle. However, we recently observed that NOD mice undergoing the spontaneous NOD autoimmune encephalitis develop seizures with considerable incidence (45), and Kash et al. (37) provided evidence for a rather strong modifier gene that predisposes NOD to seizures. Neurological similarities in GAD65 and ICA69 knockout mice may place ICA69 into the GABAergic pathway of neurotransmission, consistent with its pre- and postsynaptic localization (e.g., see Fig. 1⇑C). We were fortunate to identify a crossover event early in the backcrossing process, which replaced about two-thirds of the 129-derived chromosome 6 with NOD DNA. Nevertheless, a substantial stretch of 129-derived chromosome 6 remains. We had planned rescue experiments with a tet07-controlled ICA69 transgene, driven by the knock-in tTA transactivator. The silencing of the ICA69 promoter and consequent lack of tTA expression precluded this experiment, meant to rule out specific contributions of 129 genes to the knockout phenotype. However, comparing the CY toxicity in 129 and NOD mice failed to delineate differences in acute drug toxicity in spleen as well as testes, a tissue targeted by the drug (54). Although theoretically possible, it is therefore unlikely that the observed CY resistance of knockout mice reflects an unidentified 129 gene near the ica-1 locus. Nevertheless, whether CY resistance maps to ICA69 (likely) or a 129 gene (unlikely) is immaterial for the major conclusion of these experiments, i.e., that CY-accelerated diabetes involves direct drug toxicity to the islet. Several and similar T cell autoreactivities appear to participate in murine and human diabetogenesis (7, 10). Immunotherapy of NOD prediabetes with single autoantigens such as GAD65, GAD67, insulin, ICA69, IA-2, and others can each dramatically modify the disease course, provided that they are applied early in life, generally before the islet is breached (7). The exact mechanisms of effective immunotherapy are still elusive (for a discussion, see Ref. 16), but these consistent observations assign important potential, but not necessarily obligate roles to each target Ag. Removal of one player through gene targeting, e.g., ICA69 or GAD65 (37, 38), is the most accurate way to measure the role of an individual autoantigen, and the data available support a model of many facultative, but not obligate autoantigens in the progression to diabetes. An unresolved question in autoimmunity is whether autoantigens drive autoimmunity, or whether they are more passive elements, perhaps victims of mimicry with exogenous proteins (55, 56). At least in the case of ICA69, the former appears to be correct. There is well-established mimicry between the major T cell epitopes in ICA69 (Tep69) and the commonly encountered BSA (ABBOS) (10, 14, 16, 26, 32). T cell responses of wild-type NOD mice to BSA are extremely biased toward ABBOS reactivity. The same cells recognize Tep69 in NOD mice (16), and the same appears to apply to diabetes-prone humans (10). We expected that this polarization solely reflected properties of MHC alleles, with a very high ABBOS-binding affinity for diabetes risk-associated human and NOD MHC class II (16). This turned out to be incorrect: ICA69null mice have entirely different BSA responses, in which ABBOS is at best a minor epitope, recognized by low affinity T cells that do not show mimicry with Tep69. Demonstrating antigenic mimicry, therefore, does not per se imply a primary mechanism for loss of tolerance. However, wild-type NOD mice reared on a diet free of BSA also fail to generate mimicry T cell pools (57). The functional outcome of mimicry is thus affected by both endogenous and exogenous Ag. The resistance of ICA69null mice to CY-induced diabetes was unexpected and has since been reproduced in backcross 11 mice with ICA69 deficiency. This resistance did not reflect a generalized resistance to β cell death or autoimmune attack, since ICA69null mice develop diabetes spontaneously with wild-type incidence, and since alloxan treatment eliminates β cells just as in wild-type mice (unpublished observation). These observations, and the normal, accelerated diabetes development in NOD.scid mice reconstituted with spleen cells from either heterozygous or homozygous knockout donors suggested: 1) that CY-induced diabetes had to require effects in a second target tissue, and 2) that the resistance to diabetes acceleration in ICA69null animals could not be attributed solely to the hemopoietic cell compartment. Islet transplant experiments strongly suggest that the second drug target is islet β cells themselves. If this is substantially correct, then the islet toxicity of CY is dependent on the presence of ICA69. We propose that direct islet toxicity provides a boost to pathogenic T cell pools, providing islet Ags during the rapid, post-CY regeneration. Injury to β cells has also been implicated as a requirement for virus-accelerated diabetes (58, 59). The earliest, CY-induced change previously reported is the rapid accumulation of monokines IL-12, TNF-α, and IL-18 in the pancreas ∼2 days after drug treatment (3), 1 day after the peak of drug-induced β cell death (52). While it may ultimately not be trivial to separate cause and effect, the most obvious scenario would be that CY-induced β cell death attracts and activates professional APCs, which then engender pathogenic competence in preexisting T cell pools with islet autoreactivity. Our data demonstrate that without this event, T cells still home to the islet, but are incompetent to mediate β cell death. Overall, this process would then be analogous to the induction of NOD autoimmune thyroiditis following induction of thyroid cell death by high dose iodide treatment (60). It would differ from the effects of drugs such as streptozotocin, which kill β cells and cause diabetes in any strain, while CY-accelerated diabetes requires the NOD host with established autoimmune T cell repertoires. Consistently, the provision of wild-type islet grafts under the kidney capsule was sufficient to reverse CY resistance in knockout mice, with rapid elimination of endogenous β cells in the pancreas and consequent diabetes. This outcome confirms that islets drive pathogenic, diabetic autoimmunity, as has been suggested for natural disease development (61). The exact function of ICA69 remains unclear, but knockout mice will provide excellent tools for further study. Collectively, ICA69 knockout mice generated new insights into the role of a typical autoantigen targeted in autoimmune diabetes. The observations make it unlikely that the exogenous ICA69 mimicry Ag, BSA, has a primary triggering role in the loss of tolerance to ICA69. Instead, the highly biased T cell repertoire of NOD mice immunized with BSA now emerges as a function of autoreactive mimicry T cells driven by the endogenous self Ag. The combination of several autoantigen knockout mice should eventually allow a more complete dissection of diabetic autoimmunity. The long, drawn-out character of prediabetes remains a puzzle. The CY resistance in ICA69null mice sheds new light on this process, with a critical role for drug-induced β cell death, probably coupled to autoimmunity through the activation of local APCs. The heavy islet infiltration in CY-treated ICA69null mice vividly illustrates that the endowment of pathogenicity in infiltrating T cells is a critical progression event, which normally does not occur until very late in prediabetes. These observations favor the view that prediabetes progression is not a linear process of gradual β cell destruction (62), but rather a process that culminates late with massive β cell destruction near disease onset (63). If correct and applicable to the human disease, immunotherapy of prediabetes may be effective even late in prediabetes if it avoids precipitation of diabetes in an immune system precariously balanced between pathogenicity and nonpathogenicity. We thank Dr. Xiao Rong Peng (Toronto, Ontario, Canada) for her excellent suggestions and support throughout this project, Dr. H. Bujard (Heidelberg, Germany), Dr. M. Pietropaolo (Pittsburgh, PA), Dr. J. Elliott (Edmonton, Alberta), and Dr. W. Trimble and Dr. Tak Mak (Toronto, Ontario, Canada) for providing valuable reagents. ↵1 This work was supported by grants from the Canadian Institutes of Health Research and the Juvenile Diabetes Research Foundation. ↵2 S.W., I.A., and R.G. contributed equally. ↵4 Abbreviations used in this paper: T1D, type 1 diabetes; CY, cyclophosphamide; GAD, glutamic acid decarboxylase; ICA69, islet cell Ag 69 kDa; NOD, nonobese diabetic; Tep69, major NOD mouse T cell epitope in ICA69; tet07, artificial promoter tetoperon (×7) + TATA box; tTA, tetracycline transactivator. Sercarz, E. E., P. V. Lehmann, A. Ametani, G. Benichou, A. Miller, K. Moudgil. 1993. Dominance and crypticity of T cell antigenic determinants. W. E. Paul, Jr, and C. G. Fathman, Jr, and H. Metzger, Jr, eds. In Annu. Rev. Immunol Vol. 11: 729 Annual Rev., Palo Alto. Karges, W., H.-M. Dosch. 1996. Environmental factors: cow milk and others. J. P. Palmer, Jr, ed. Diabetes Prediction, Prevention and Genetic Counselling in IDDM 167 John Wiley & Sons, Chichester.